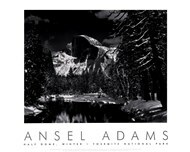 Half Dome art is comprised of photographs and paintings depicting the famous rock formation in Yosemite National Park. These pieces are available in many different styles and show the impressive structure from several angles, creating a variety of decorative choices for different settings. 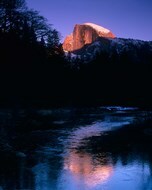 The Half Dome is a granite structure in Yosemite Valley that rises over 4,000 feet above the valley floor. This enormous landmark is an excellent subject for artistic portrayal. Unlike some mountain ranges, a touch of green added by surrounding plant life makes this area uniquely attractive. The art pieces featured in this section are available featuring a variety of color combinations. 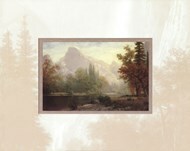 A Half Dome painting like “Half Dome, Yosemite Valley” by Albert Beirstadt showcases a multitude of blues and darker browns and oranges that would make a great addition to a relaxed environment with darker colors. For a brighter and more vibrant appearance, there are daytime photographs of the formation that include the surrounding plant life. Black and white photographs of this landmark are also available for those who prefer a sharp, modern look that will blend in with a less colorful area. 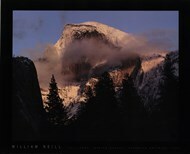 Half Dome photographs and paintings are a popular item with both fans of nature and California natives who want to display an attractive feature of their home state. Adventurers and mountain climbers may also use this artwork as part of a larger theme, depicting places they have been or destinations they hope to visit in the future.